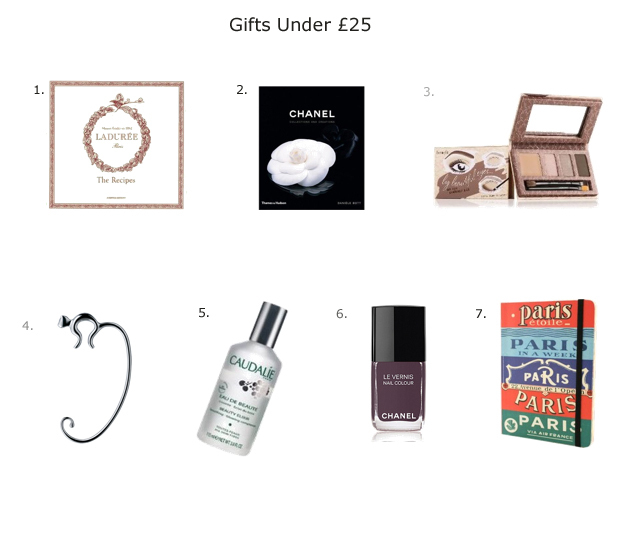 Previously, I'd compiled a list of gifts under £10. However, there are times when you've got to spend a little bit more so I decided to put together yet another list. This time I've included goodies that cost no more than £25. Their macarons are like manna from heaven. Now you can have access to their recipes in a beautifully bound book. Any Chanel lovers would be delighted to get this book. These shades are universally flattering. £25 won't get you a handbag but every purseaddict know the importance of a purse hook. These are a lifesaver. I don't fancy putting my bags on the floor so these come very handy especially when you're in a restaurant. The name says it all! One spray promises an instant burst of radiance. No woman in her right mind will turn down a bottle of Chanel nail varnish. The notebook comes complete with important addresses as well as a map of the metro. It's the perfect gift for a Francophile. Sharon & chicology I came home with a bottle of Chanel nail varnish yesterday. I've got my eye on the book as well. I've never tried a Chanel nail polish - are they that good? I usually stick to my cheap Essie polishes. I love all these gifts! Mary Lane, funny enough I've always bought Chanel nail polish as gifts for my sisters in law but never for myself. Surprisingly, they're pretty good unlike the cheap Rimmel ones that smear everywhere and stick to your skin when you try to remove them.